Once spaghetti is cooked, drain it and put it back in the pan. 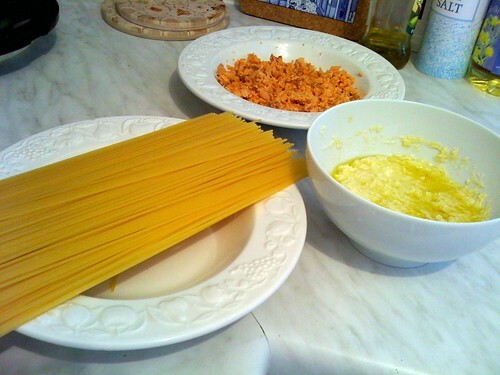 Thoroughly mix the creamy cheese-lemon-oil mix, the mashed salmon, and the spaghetti in the pan. Pronto! The lemon adds a fresh touch to the tasty combination of cheese and salmon. Ideally, you should use fresh salmon baked in the oven but it’s just simpler to use the canned one. Let me know if you try this recipe and what you think. Bon appétit!